Bringing you the best of both worlds with the sophisticated appearance of solid timber, and all the stability, energy efficiency and durability of modern materials. These doors use a unique combination of the strongest materials in the world, including steel. GRP, toughened triple or double glazed units and high density polyurethane. With 'Secured by Design' police approval, these doors use the latest in locking technology to challenge even the most experienced criminals giving you complete peace of mind. 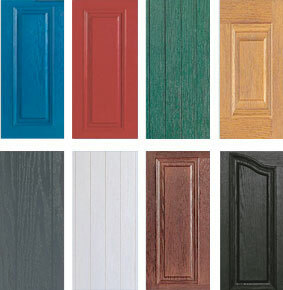 The energy performance of your home can be greatly increased by composite doors. The high density polyurethane core conatined within each door brings a higher level of strength and insulation in comparison with traditional doors. These doors have low-maintenance, highly robust colour finishes which are designed to stay looking good year after year, both on the outside and on the inside. Choose the perfect colour for the exterior of your home and match it with the perfect colour for the inside. Plus, for absolute consistency even when the door is open, every edge is also colour matched.